Chris Weitz - director of THE GOLDEN COMPASS and scriptwriter on ROGUE ONE - returns to our screens with this retelling of how a small team of Israeli secret agents abducted top ranking Nazi Adolf Eichmann from Argentina and smuggled him out on an El Al flight to stand trial for his crimes in Israel. As Israel Prime Minister David Ben-Gurion (a cameo from Simon Russell Beale) explains to his agents, and so to the less historically literate audience - getting Eichmann to Israel is they key because it would be the the first time a Nazi would be put on trial by his victims, rather than by World War Two's victors. But should the mission fail, it would have been humiliating for the nascent state of Israel, and open it to justified accusations of having disrespected the sovereignty of Argentina. And so we get a movie that is book-ended by a true-life thriller that is superbly executed. Oscar Isaac plays the lead Mossad agent Peter Malkin and the only significant change to historical make-up of the team is including a female agent and love interest for Peter in Melanie Laurent's doctor - crucial in keeping the captor sedated. We see the team take the intell from a Jew living in Argentina - his daughter is dating Adolf's son - and travel there to try and get a photo and a positive ID. These scenes are both the most tense and the most chilling - showing an active underground of Nazis in hiding and the rabid ideology of the next generation. We then move to the abduction and Adolf's apparently rather quick admission of his real identity. It's at this point that the film switches gears into a slow two-hander between Isaac's Malkin and Ben Kingsley's Eichmann. El Al is apparently squeamish about carrying a kidnapee and want him to sign a document agreeing to exfiltration. When Mossad's actual psychological manipulation plan fails it's left to Peter to try and kindle a relationship with Eichmann and persuade him that the trial will be fair, and will allow him to tell his side of the story. Not only does the pace of the film drastically slow at this point, so too does the historical plausibility. The relationship between the two men just doesn't feel credible. And I found the film dangerously close to having sympathy with Eichmann - because that's the implication of having the two men try to relate to each other qua men. The whole thing just left me a little bit squeamish and prevented me from enjoying what should have been two fine actors riffing on each other. Once we traverse this longueur we get back to the thrilling exfiltration - here on slightly ropier grounds when it comes to historic accuracy -and on to the trial. Anyone who wants to know more about this should check out a fantastic BBC drama called THE EICHMANN SHOW. We see him condemned but I wonder if younger viewers will really understand why. And we then get a kind of kitschy but hopeful ending involving the Melanie Laurent character. I found it all a bit of damp squib and a real shame after this film started so strong. 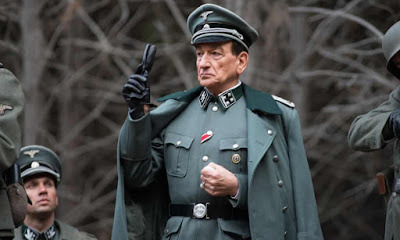 OPERATION FINALE was released on October 3rd in cinemas in the USA and on Netflix in the UK.